Please join us at the panels below, brought to you by Dark Horse Comics and friends! 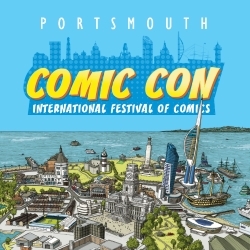 Please visit https://rosecitycomiccon.com/programming-schedule/ for more panels featuring Dark Horse creators and guidelines for attending panels. It takes a team to bring a comic book to life, and that team extends beyond the writer and artist. Colorists and letterers are often the magicians behind the curtains whose finishing touches are what breathes life into the finished product. A colorist adds depth, tone, and dimension to the story unfolding on the page, while a letterer guides the reader smoothly through the story. Dark Horse would like to peel back the layers on the work of comics’ unsung heroes and celebrate their contributions to our beloved art form. Have you always wondered what a comic book editor does? Do you think you have what it takes to become a comics industry professional? Dark Horse wants to give you insight on breaking into the industry and working with a powerhouse publisher! Join Dark Horse editors for a rare behind-the-panels look at the secrets to breaking into the industry and building successful comic and graphic novel programs. Comics are a great way to get kids interested in art, reading, and storytelling—and, well, they’re fun! Join Cecil Castellucci (Soupy Leaves Home), Amy Mebberson (Disney Ralph Breaks the Internet: Click Start—A Select-Your-Story Adventure), and Stan Sakai (Usagi Yojimbo) to discover and discuss the ever-growing library of incredible all-ages comics!